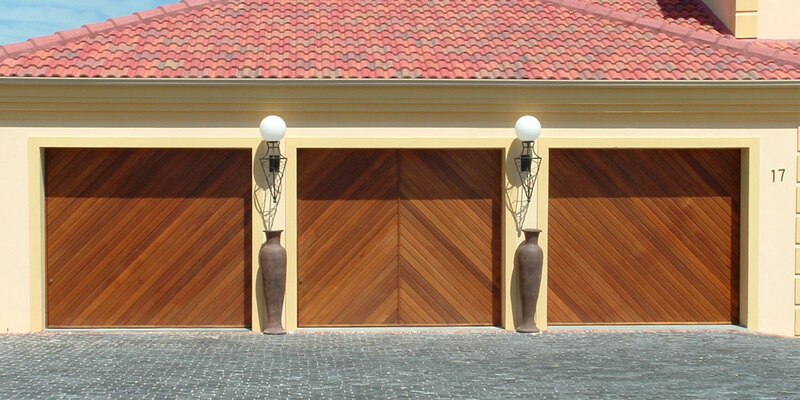 Meranti garage doors are usually recommended for garages that are exceptionally close to the sea, in order to have no rust erosion problems on the garage door. However, do bear in mind that all sectional overhead garage doors, including meranti doors, use plated-galvanised mild steel hardware for the tracks etc. The springs are not galvanised. Meranti garage doors are made up from an imported meranti wood, and come standard with a coat of golden brown meranti seed oil. It is important to note that these are the standard opening sizes for your garage door opening, as a maximum of 100mm still will be added to these sizes to get the standard panel size of the garage door itself. All sectional overhead doors need to overlap with a minimum of 30mm to a maximum of 100mm, on the inside side walls of the garage. The door should also overlap with 30mm at the top of the garage. Horizontal slatted and raised & fielded (blocks) meranti doors come standard with a coat of golden brown meranti seed oil. Meranti sectional overhead doors are available in either a horizontal slatted or raised and fielded (block) panels. It is however, important to note that if you opt for raised and fielded panels, and your door is not a standard size, you should consult your installer as to whether the blocks will be cut off, either on the sides or at the top of door, in which case, you should probably have a horizontal slatted door installed. The slats on a meranti horizontal slatted sectional door are 145mm wide and have a tongue and groove join. Other available types of meranti garage doors are studded, gothic and rustic. These doors are not very common, and have a unique pattern and style. All three of these doors have studs fastened onto the panels. The studded door has square studs, and small, square raised & fielded panels, whereas the gothic and rustic doors, have round studs and long rectangular raised & fielded panels. Gothic meranti doors are stained with dark ebony colour and rustic doors are dark rustic brown in colour. Sectional overhead garage doors require 450mm head room, from the bottom of the lintel to the bottom of the ceiling or rafters, for installation, this amount of head room must follow through 3m back into the garage. It is possible to install a sectional door with a minimum of 250mm head room, however this will require a flip over panel to be installed. For a sectional overhead door to be installed properly the garage needs to have a minimum of 100mm wall nip space on either side of the garage, ideally 150mm nip space is needed. Meranti sectional overhead garage doors have a rubber seal inserted onto the bottom of the garage doors that allows the door to get a complete seal on the bottom floor, preventing far more dust etc, from entering the garage. Side seals are also available to be installed on the outside of your garage door, on either side. These are used to completely seal the door from the outside elements, as the rubber seals are placed up right up against the door. A sectional garage door should sit 10mm away from the garage walls, in order to prevent the door scratching on the walls or getting caught on the wall, preventing the door from sliding smoothing up and down. Meranti doors must be oiled at least every 6 months with a seedi oil that will allow the door to breathe. 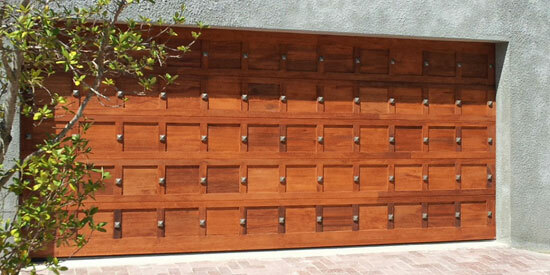 Meranti doors need to be allowed to breathe to help maintain the lifespan of the garage door. If the door is not oiled regularly, the wood will begin to rot and the lifespan of the door will be greatly reduced. Do not paint or varnish meranti doors. All sectional overhead doors need to have the tracks, hardware, cables and springs regularly sprayed with silicone spray or Q20. Greasing the doors’ hardware is not recommended as the grease forms a grinding paste with dust and sand particles, which encourages rust and decay. The slats on a meranti tip up door are 96mm wide and have a tongue and groove join. Tip up doors should be installed only if your garage is not on the boundary or if there is enough space in your driveway in front of the garage, this is because a tip up door tips up and out of your garage, which means that a car or anything for that matter, cannot be parked directly in front of the garage doors. Tip up garage doors need 200mm head room, from the bottom of the lintel to the bottom of the ceiling or rafters in the garage, for installation. When the meranti tip up door is in the open position the garage will lose +/- 130mm from its height. Single tip up garage doors are installed with a hinge and tension spring mechanism on either side of the garage door. Each hinge contains ball point bearings. Double tip up doors should always have two springs attached to each hinge, in order to neutralise the weight of the double door. For a tip up garage door to be installed properly, the garage needs to have 80mm wall nip space on either side, this is where the styles of the tip up door are installed. If this is not available, the style will become more visible. Tip up garage doors require two styles for installation. A style is a tall cubed piece of timber, usually 69mm x 45mm wide, for single doors, 69mm x 69mm wide for double doors, spanning higher than the garage door opening height. Each style is installed on either side of the garage opening, on the inside of the wall. The hinges and springs are then mounted onto the styles and the door attached to the hardware. 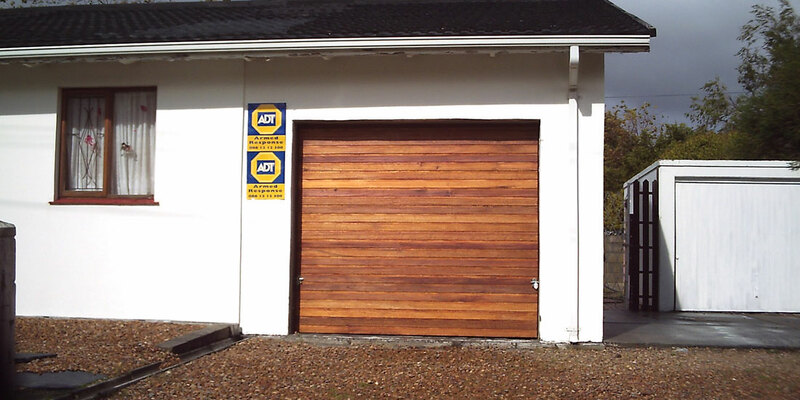 The door should be +/- 30mm smaller than the opening size of the garage, to ensure that the door will clear the opening, when tipping up and open. The styles also ensure that the door does not rub up against the garage walls, but rather can rub up against the wood of the styles, preventing any scratching and damage to the door. A tip up garage door must have a minimum of 20mm overlap on the inside of the garage, at the top. 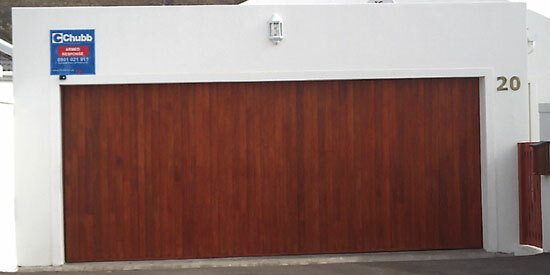 For a quote on a Meranti Garage Door, contact LHV Garage Doors & Gates today!